Disney Babies Blog: Trivia Tuesday! 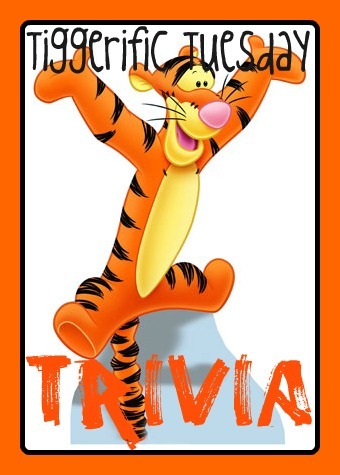 Welcome back for more Tiggerific Tuesday Trivia with hosts Jodi from Magical Mouse Schoolhouse, Mike from My Dreams of Disney, and Heidi from Heidi Says. The voice actors behind the characters of Mickey Mouse Clubhouse (and all animated cartoons) do more work than only the one show. For example: Minnie Mouse, Russi Taylor, also voices several characters on the Simpsons, Jake and the Neverland Pirates, and was even Huey, Dewey, and Louie for Ducktales! The one I recently realized was discovered only by chance - Noah's (almost 3) new favorite show is Curious George. I noticed that Chef Pisghetti sounded a lot like MMCH Pete, and what do you know - both are voiced by Jim Cummings (who also voiced Winnie the Pooh and Tigger for a 2011 tv series). Jim Cummings also voiced Ray, one of my favorite characters from the Princess and the Frog! That's interesting. You know, I don't think the voice actors probably get nearly enough credit - that has to take an incredible amount of talent! Thanks for sharing. Voice actors are very talented! What fun! Thanks for co-hosting, Jenn!